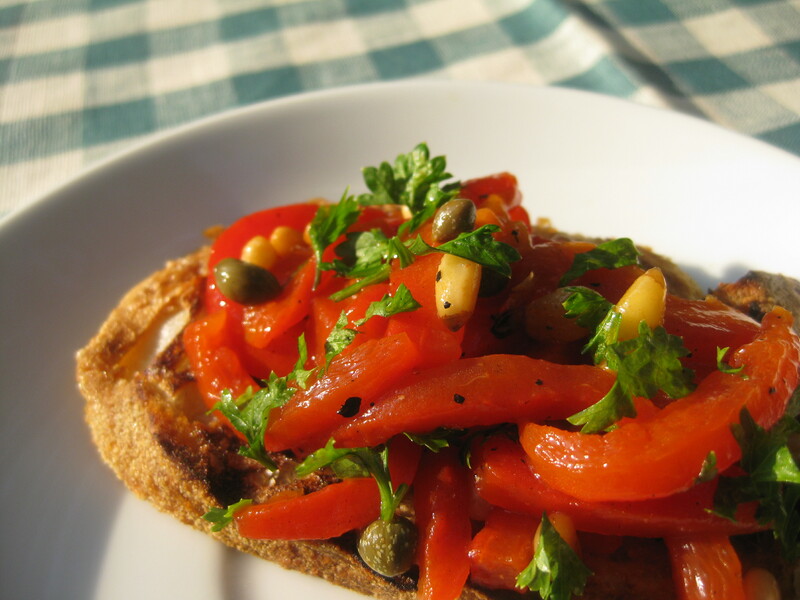 Sweet red peppers, lightly stewed and sprinkled with vinegar, make a simple condiment that can be garnished with capers, toasted pine nuts and parsley, or not. Served on toasted bread as bruschetta or alongside goat cheese with crackers, it is a simple, tasty appetizer. It can also be used as a condiment for grilled eggplant or tuna. I used to make this simply by charring and peeling a red pepper and dressing it as is, but then I read Paula Wolfert’s wonderful book, The Slow Mediterranean Kitchen, in which she recommended stewing the thinly sliced peppers in a little water. This method cooks them thoroughly and setting the mixture aside for a day allows the other flavors to be absorbed. This is now my preferred method. One pepper serves two, so make more or less to your liking. Here’s the method. 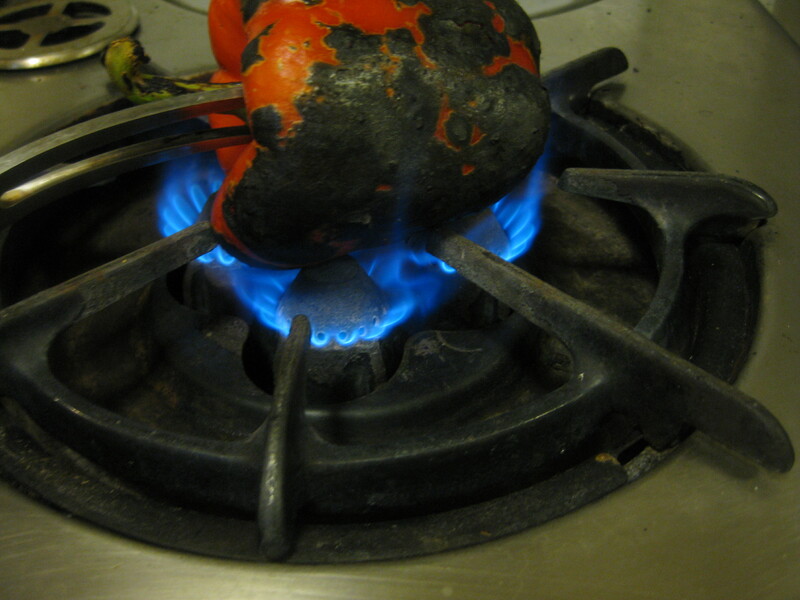 Char red peppers over a gas flame until blackened. Place in a paper bag for about ten minutes. Flake the charred skin off the pepper with a paper towel. Do not be tempted to use water, as that will dissipate the valuable oil and juice. Remove the seeds and ribs and slice the peppers into thin strips (1 ½ x 1/8 inches). If you are using pine nuts as an ingredient, toast them lightly in olive oil and remove to cool. Add the peppers, capers if using, and small amount of water to the pan and simmer the peppers, stirring, for about 3 minutes or until the peppers are thoroughly cooked. The water should be fully absorbed or evaporated. Remove from the heat and cool slightly. Add a splash of vinegar (I prefer sherry vinegar as does Wolfert, but red wine vinegar would also work), salt, parsley and reserved pine nuts. This is best made the day (or at least hours) before serving so that the flavors get fully acquainted. If you refrigerate the peppers overnight, bring them to room temperature before serving.